Digital temperature guns enable you to quickly and accurately measure surface temperatures (Source). They use infrared thermometers as well as technologically sophisticated laser hardware to gather these temperatures without making direct contact. This is important because a non-contact thermometer enables you to get the temperature of moving targets or services that are extremely hot. Some users even describe using it to check how hot there microwaved food is! Once you buy one of these infrared temperature guns it's doubtless that you will enter a phase where you become addicted to measuring the temperature of everything around your house. On average, most models can measure a temperature range of -32°C to 530°C, which is -26°F to 986°F (Source). EtekCity says that it is ideal for using when cooking & barbequing, doing auto-repair work, performing common home repairs, etc. These instruments have a diverse array of applications and many non-users are not aware of their full potential. Using the laser pointer beam, you just have to aim it at an object, even if it's small, then press the trigger and the screen will display the temperature. 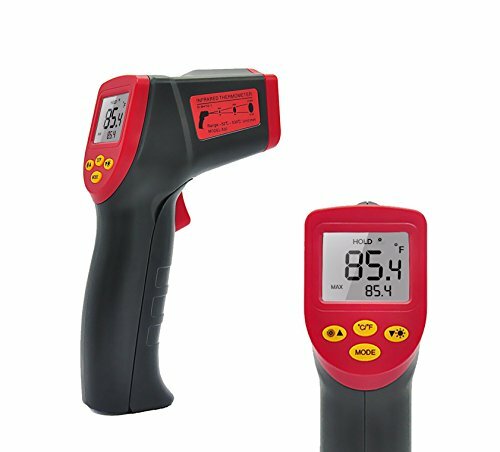 Let's take a look at five of the best-selling digital thermometer laser point temperature guns on the market today. This non- contact infrared digital thermometer laser point is well designed by Aidbucks for quick and accurate measurement of different surface temperatures between the ranges of -32℃ to 530℃. 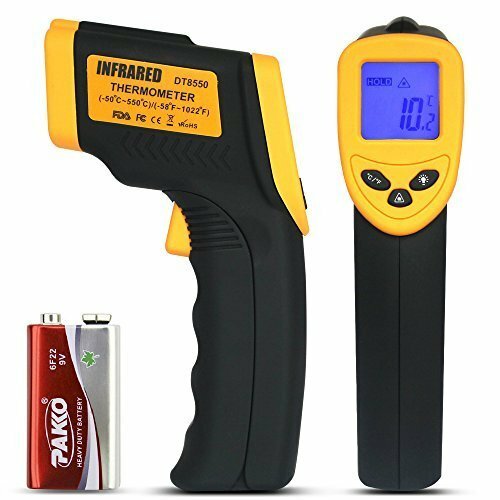 This infrared thermometer makes use of advanced laser technology to project at various places without making direct contact. However, you may find the automatic turn off function after seven seconds slightly annoying. 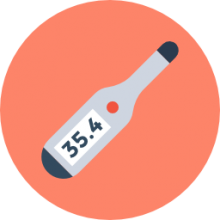 You can use this thermometer both outdoors and indoors and store it easily. This non-contact thermometer can be particularly used for measuring the temperature of objects with extreme hot or cold temperature or of moving objects. You can use this device to scan insulation leakage in your home, check the cooling system of your car, temperature of catalytic convertor, tires, brakes, wooden oven, food before serving, etc. 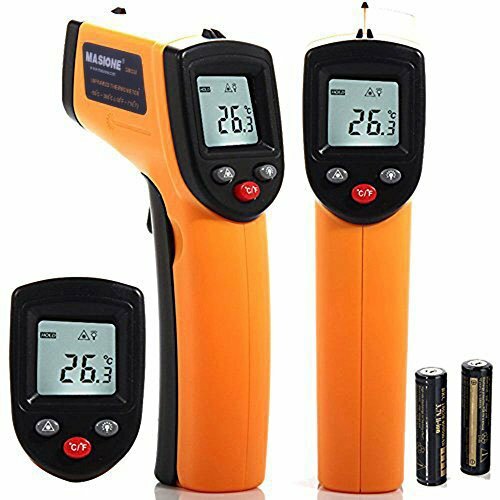 This non-contact Digital Laser IR Infrared Thermometer Temperature Gun is based on the principle of point, aim, and measure. The Etekcity Lasergrip is available in a combination of Yellow and Black colors. The best part of this product is that you do not have to set it up- it’s ready to use right out of the box. You can safely measure extreme ranges of temperature from -58°F to 1022°F or -50°C to 550°C, without contacting any surface, ever. The Etekcity Lasergrip is a best buy if you are looking for a digital thermometer at a relatively cheap price. This non-contact, Digital Laser Infrared Thermometer is a great household and commercial product. It can measure surface temperature within a range of -58°F to 716°F (-50 ~ 380℃). It is easy to handle in your hand and comes with a battery. An expert user has claimed the accuracy of the product to be ±1.5℃ or ±1.5%. You have the option to turn on/ off the backlight manually. Some users find the auto turn off feature of this temperature gun slightly bothersome. Overall- another solid option to consider. 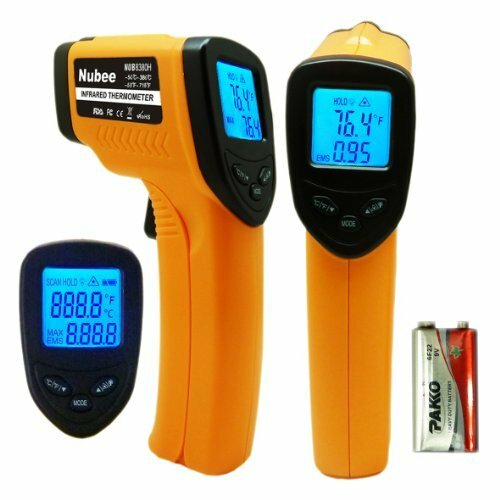 This non-contact, Infrared Thermometer Temperature Gun comes is capable of reading extremely high surface temperatures- with the data saved at the base of the screen. The EMS adjustable function allows the temperature gun to make accurate readings according to the emissivity of a particular surface. You can measure the temperature in the range of 50°C to 380°C or -58 °F to 716°F. Yet another solid option to consider. 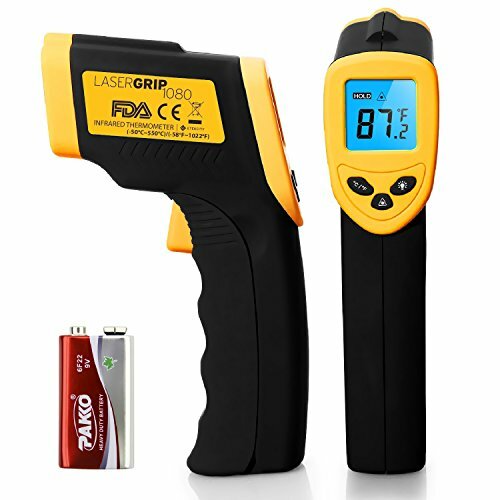 This non-contact Temperature Gun by LP comes with an LCD Laser Sight- once you take the reading by pointing the laser at a surface, you can take instant readings in your hand. The thermometer comes in a combination yellow and black. Users like that this product requires zero set up. The laser guidance gives you an accurate idea of which spot to aim at. You can measure surface temperature in the range of -58°F to 1022°F or -50°C to 550°C. Digital temperature guns frequently include a wide measurement range and measurement accuracy of + or -1.5% +1°C. The distance spot ratio is generally around 12:1. When using your digital thermometer gum, keep in mind that the maximum/minimum value will let you know the measurement of the maximum and minimum temperature values. The AidBucks digital temperature gun will record 32 sets of data so that you will be able to measure multiple objects temperatures all at the same time. A handy feature that most of the digital temperature guns have is an automatic off functionality so that the battery doesn't drain out- there's also a low battery warning so that you can swap out the battery before it dies. If you are looking to purchase one of these digital temperature guns, check out our comparison table and review the product pages to ensure that the digital thermometer will meet your specific requirements. One user describes enjoying how ergonomic the non-contact digital thermometer is. He describes using it to measure his pizza oven, to assess teas, soups, and microwaved foods, as well as wall and ground temperatures. More professionally he uses it to set up thermostats and optimize his indoor heating by finding cold spots. In general, these are really useful devices that have a wide variety of different applications. whether you are a homeowner conducting due diligence regarding your indoor heating, or a business owner with more commercial applications, you can find an inexpensive and high quality digital thermometer that's right for you.